The single-screen version of the Kno. The first generation of the highly anticipated Kno tablet will begin shipping this week, Kno Inc. told us Monday. The first units will	be sent out Tuesday for those who preordered the devices, with initial shipments staggered over the coming month. Students and faculty are being given priority. The Kno tablet, designed specifically for higher education, will be available in limited quantities via invitation starting tomorrow for $599 for the single-screen model and $899 for the dual-screen model. Kno devices sport one or two 14.1-inch, 1,440 x 900-pixel touchscreens and can display full-scale textbooks , videos, and other multimedia. 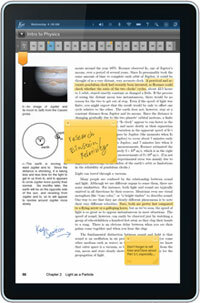 They also support notetaking, educational apps, Web browsing, and content sharing. Kno is also operating an electronic textbook store featuring "tens of thousands of textbooks from most of the major publishers, with new books being added regularly," according to Kno. 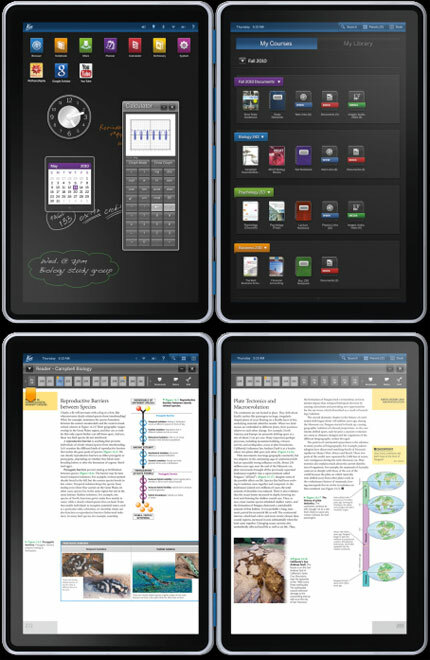 The tablets made their formal debut in June 2010 in the dual-screen configuration and went into beta testing with higher education students this fall using software from education publishers Cengage Learning, McGraw-Hill Education, Pearson, and Wiley. The single-screen version was announced in late September. Kno devices sport one or two 14.1-inch, 1,440 x 900-pixel touchscreens and can display full-scale textbooks, videos, and other multimedia. They also support notetaking, educational apps, Web browsing, and content sharing. Long battery life (up to a "full day on campus," the company said). Two views of the dual-screen version of the Kno tablet. A limited number of orders are available now through invitation only. Kno has not indicated when the tablets will be more widely available. Further information, as well as a request for purchase form, can be found here.